The world has still never seen anything like it and perhaps may very well never again. If there was only one thing the UNION of SOVIET SOCIALIST REPUBLICS could always be counted for, it was most certainly a powerful contestant for the ice hockey tournament at the Winter Olympic Games. 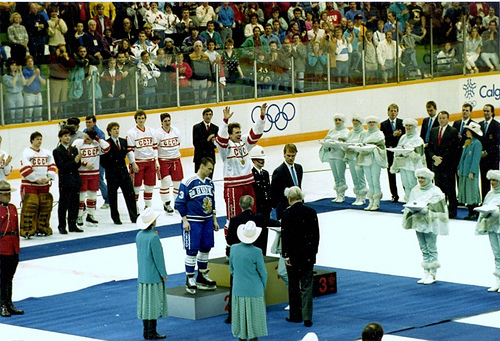 When Soviet captain VYACHESLAV FETISOV and his teammates accepted the gold medals at the Calgary Games in 1988, it marked the seventh occasion in Olympic history that the USSR secured the championship; to contrast, the country that is credited with creating the sport of ice hockey, Canada, had collected six gold medals at the Olympics up to that point. Although many in attendance at the Olympic Saddledome for the medal ceremonies may not have known at the time, the 1988 Calgary Games on the plains of western Canada would mark the final official appearance of the Soviet Union at the Winter Olympics. The USSR had first sent a squad to compete for Olympic glory at the 1956 Cortina Games in the Italian Alps. In between, the Soviets skated at nine tournaments literally all over the world and, including ‘qualification’ games, won an astounding 55 games against just five losses with two draws. The winds of change were already beginning to blow, however, and so the Calgary Games were the last Winter Olympics that saw the old CCCP sweater. Copyright © 2010 WORLD HOCKEY. Powered by WordPress and A Dream to Host theme by Art of Blog.